I am honored this week to join the roster of car lovers with archived interviews in the CarsYeah audio library. Give this one a listen, I share a bunch of history about the evolution of our business, and much of this discussion has not been previously recorded anywhere else. Click here to listen to the podcast. 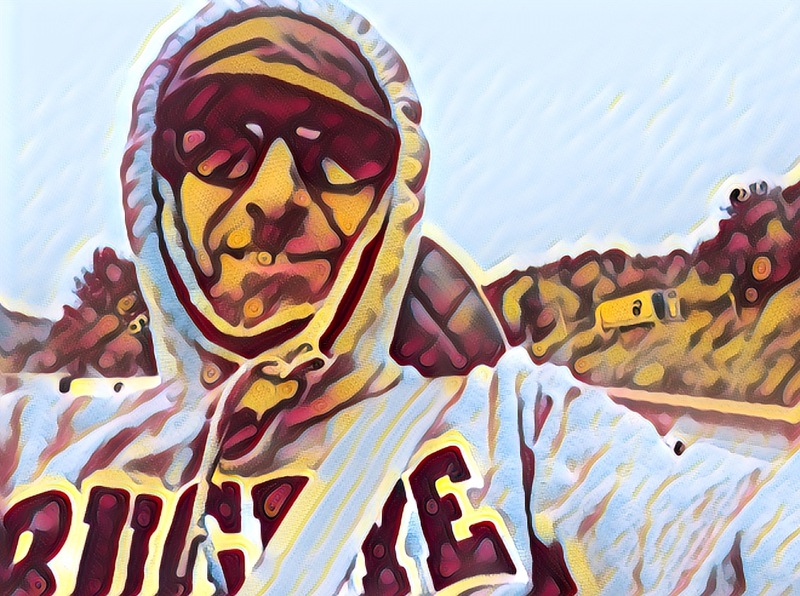 Check out the library of recordings, there are many great auto-interviews at this website. Here’s another tribute to a great car (and customer!) as we close out 2016 and approach our 200th Bugeye sold. Back in June of 2012, Joe Colopy bought this awesome Bugeye called Horton (our 54th sold). 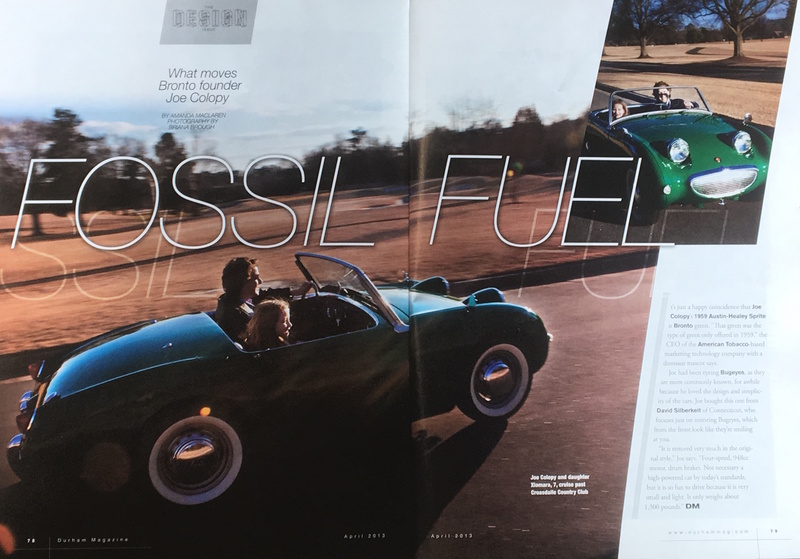 In this nice article (above) in Durham (NC) magazine, he’s out for a drive with one of his kids. 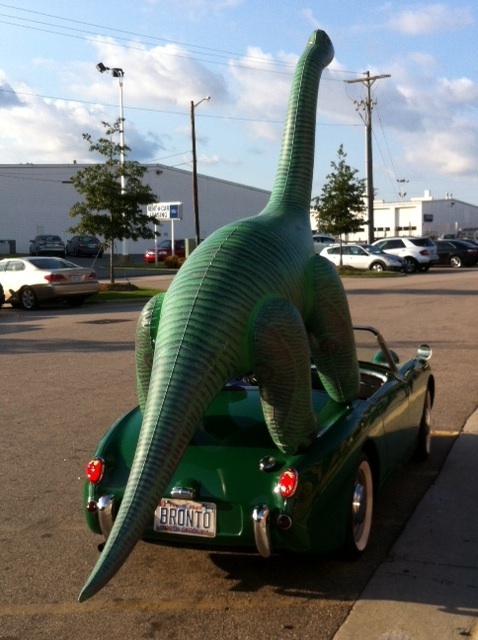 Joe owns Bronto software, and here he demonstrates how well a Bugeye Sprite can serve a company mascot. 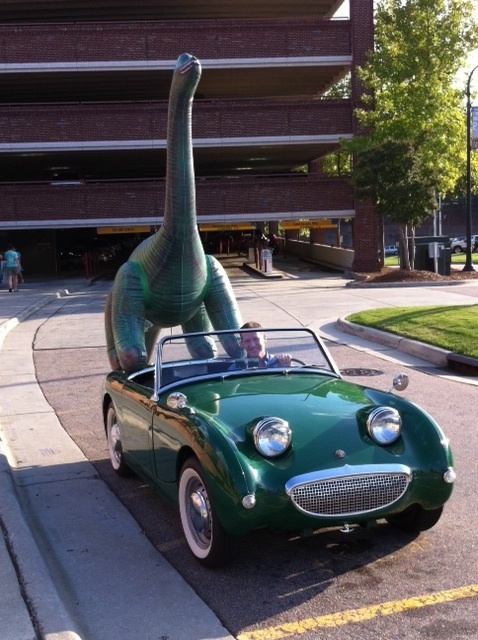 Which has a bigger presence, the Bugeye or the Bronto? Remember the Bugeye we had for sale this year called “Atlanta?” This mostly stock iris blue Bugeye was purchased by Todd and Donna Lassa in Michigan. 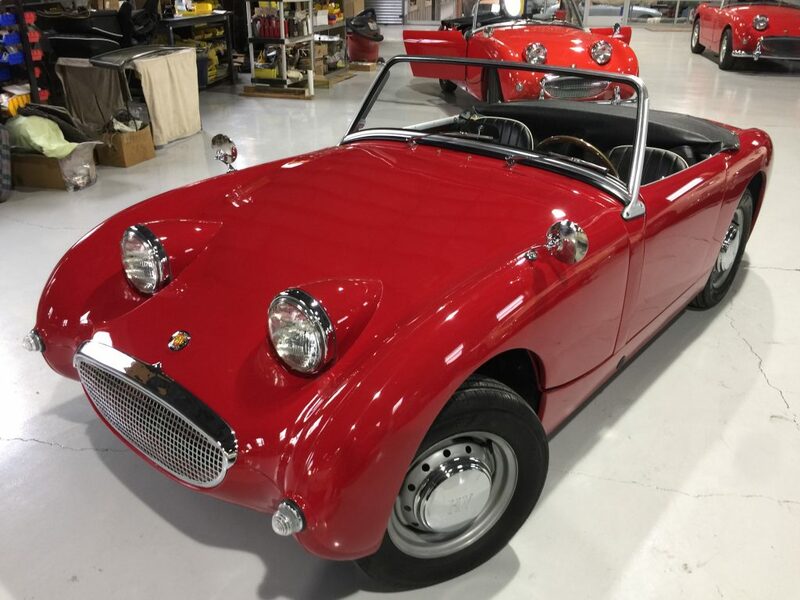 Todd is the Detroit bureau chief for Automobile Magazine, and here is his great feature on his own personal car. Todd drives a lot of different cars every week as part of his job, and we are honored that he has adopted this Bugeye as a full-time resident in his garage. 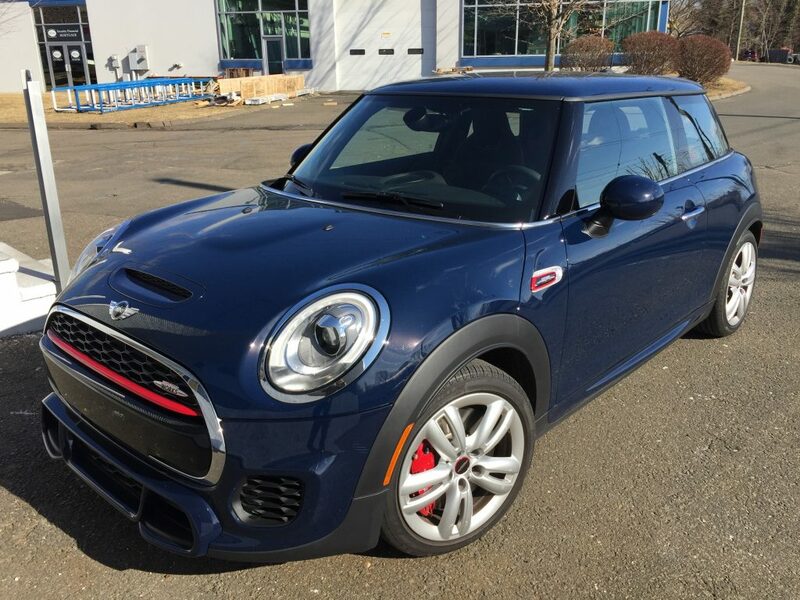 That’s Todd above–click his car to read his story or visit their site by clicking here. 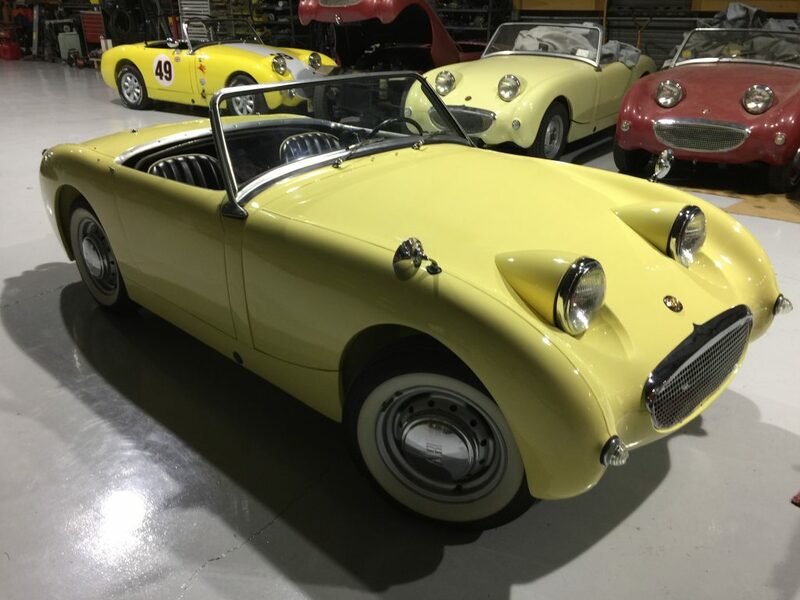 Sometime between Thursday night May 12, 2016 and Friday morning May 13, this Bugeye Sprite (AKA Drucilla) was stolen in Redwood City, CA. 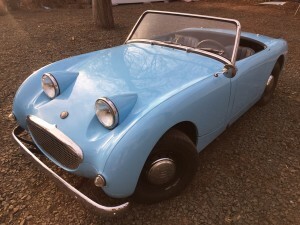 Keep an eye out for this unique Bugeye Sprite, especially if you are in The Bay Area. The car has a number of quite distinctive markings, including unique flip forward nose latches that are white plastic and flush mounted (these latches are visible in the photo above, behind the front tires). The paint is pearlescent white. More pictures are linked below. 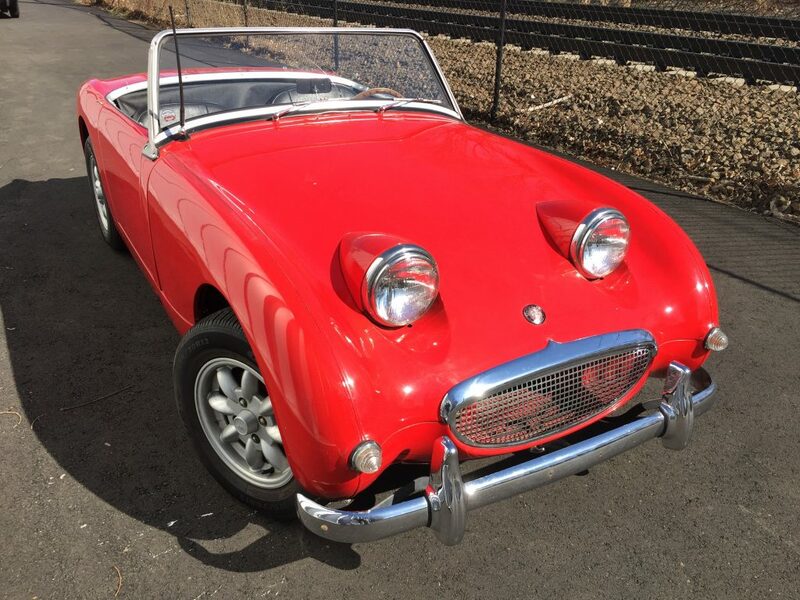 Of the 175 Bugeyes we have sold, this is the first that has been stolen, and I am guessing it was taken by vandals, a “crime of opportunity.” It was parked behind an auto stereo shop overnight awaiting it’s new sound system. Anyone with information can email me (david@bugeyeguy.com) or contact the Redwood City Police department. 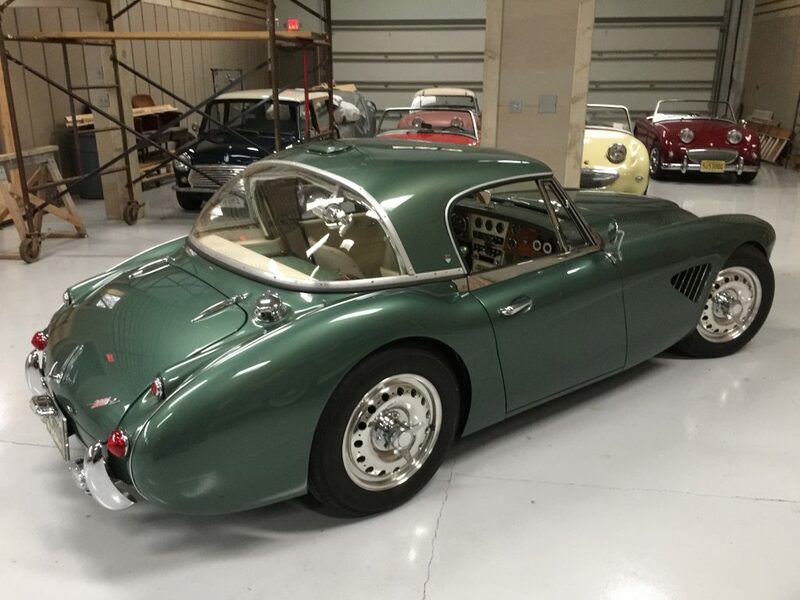 The car’s vin number is AN5L-39165, identified by the plaque on the frame beneath the carburetors. I have the body numbers too, but it should be very easy to identify a pearlescent Bugeye with wire wheels and other external features as shown. 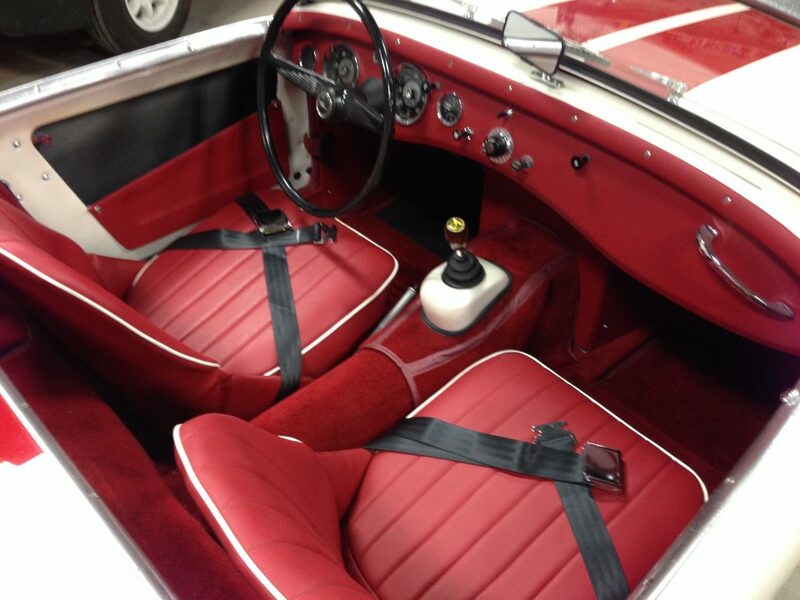 It’s also configured with a Datsun five speed transmission. 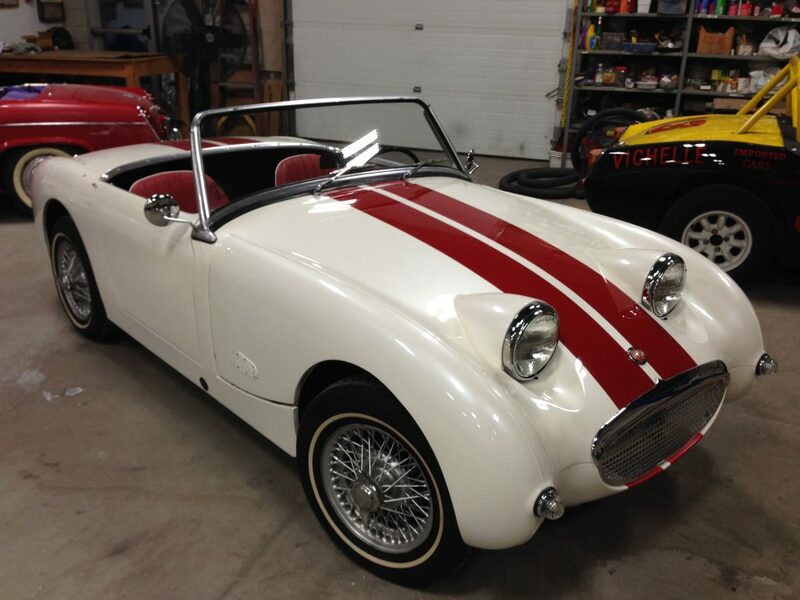 Our second Hemmings Sports and Exotic Car cover! 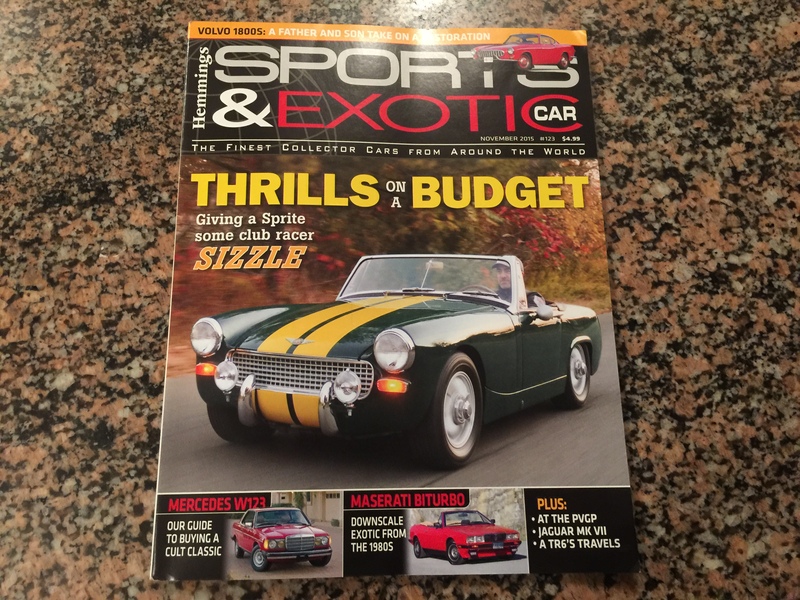 I was ecstatic to open my mailbox recently and find myself driving a Sprite on the cover of my favorite car magazine. 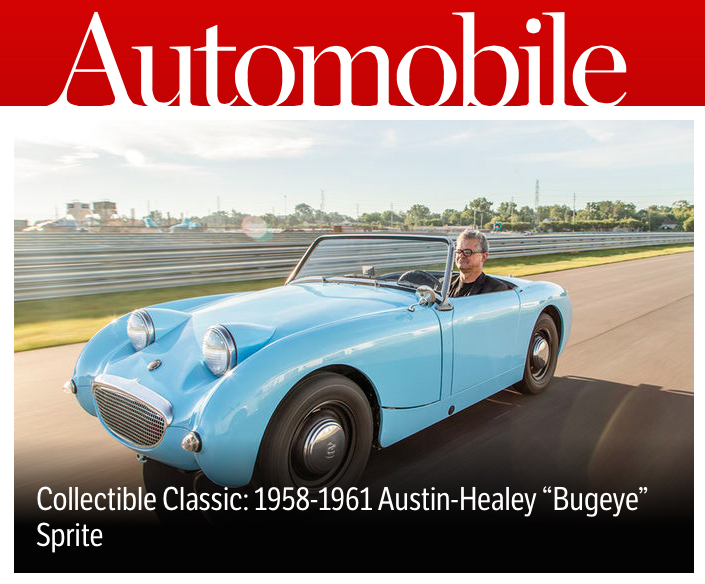 Hemmings Sports and Exotic car #123 (November 2015) includes a great feature about our 1965 Sprite club racer. I knew Hemmings would eventually run a story about the car, but to see it on the cover, (with me driving! ), was quite a wonderful surprise! This is the second cover to feature our cars and quite an honor for me, since I routinely read every issue from cover to cover (Click here to read our first Hemmings Sports and Exotic Car Cover story from Sept 2013.) This new piece is our third feature by the way, with a story in July of 2014 about our Supercharged Bugeye which you can read by clicking here. Our whole staff is nuts for this magazine… Bob our welder reads these mags carefully one page at a time, in sequence!!! I asked him if he saw our Sprite cover, and he said he hasn’t looked at the current issues yet, as he is still reading the May 2015 issue and hasn’t yet caught up. I purchased this car from the builder roughly a year ago. We sorted a number of issues, improved a number of systems, and then sold it to Ron from Tennessee who you see featured in the story. Dave LaChance from Hemmings had visited to drive the car when we had it, and it took about 18 months for an opening for this story to run. 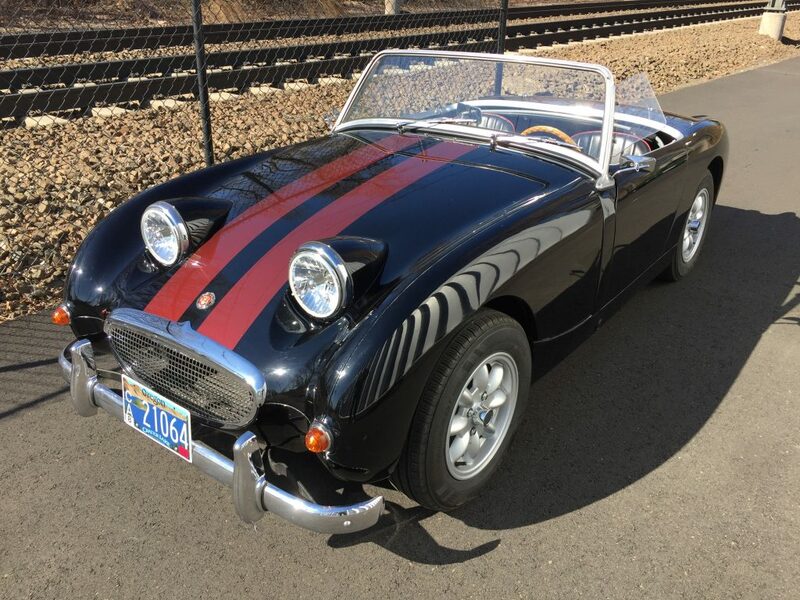 Click here to read this new cover story “Sprite Done Right.” If you haven’t already subscribed to this publication, I hope you will do so, as the magazine would certainly appeal to anyone who enjoys our site, and you’re invited to support what I think is the best car publication for vintage sports car enthusiasts! Automobile Magazine’s Jamie Kittman came to our shop recently, in the 641 HP McLaren 650S you see parked in these photos, to ponder the rise and rise of British sportscars from Bugeye to McLaren. 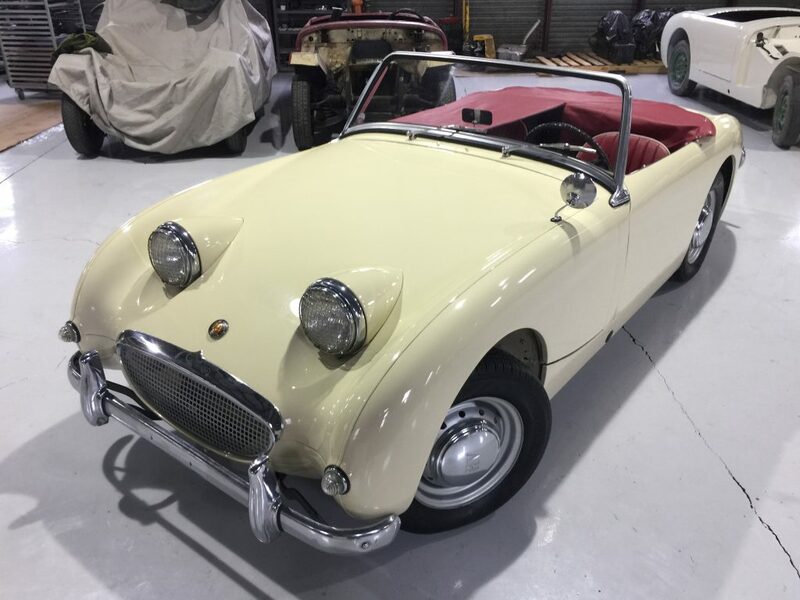 He drove two Bugeyes; the 43 HP box stock Nevada Beige Bugeye barn-find we recently restored for a client from Ohio (above), and the modified Sprite “Cole,” with a 110 HP 1380 cc engine and five speed transmission (below). 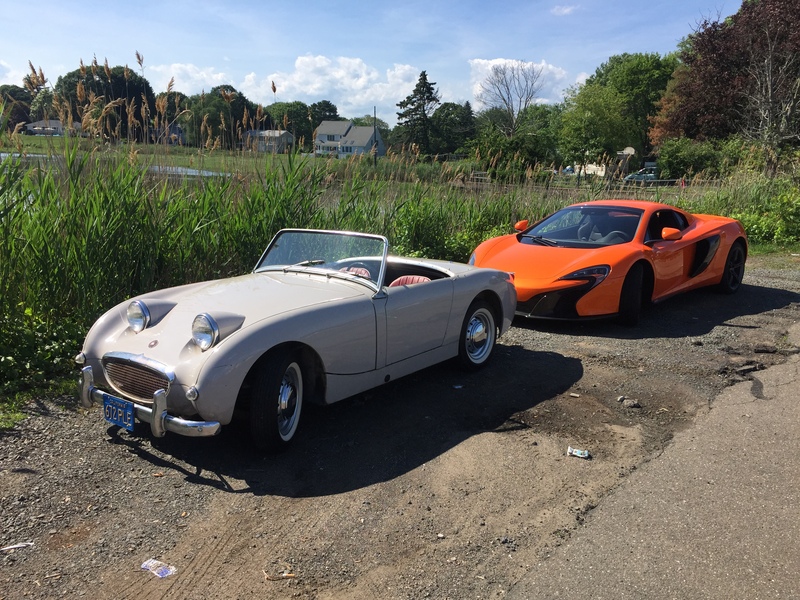 Then he let me drive the McLaren (two Bugeye drives for every supercar ride? Perhaps a fair trade…). I never drove anything quite like this $332k supercar, and while it was blindingly fast, I felt more like I was sitting in a moving computer than driving a sportscar. It shifted for me, and teased me with some paddles which didn’t really do what I wanted, unless I kept pulling to keep the car from shifting. Perhaps if I read the manual I would figure out how to find manual mode. But for now, I would have to say that the big orange Mac was a bit like a smartphone driven thermostat that requires a proper WIFI hook up before you can lower the air conditioner a few degrees (and sadly, I can’t remember the password for the network). Sometimes, an old honeywell thermostat with a big plastic dial works just fine. But then again you might expect such a perspective from a Bugeyeguy. 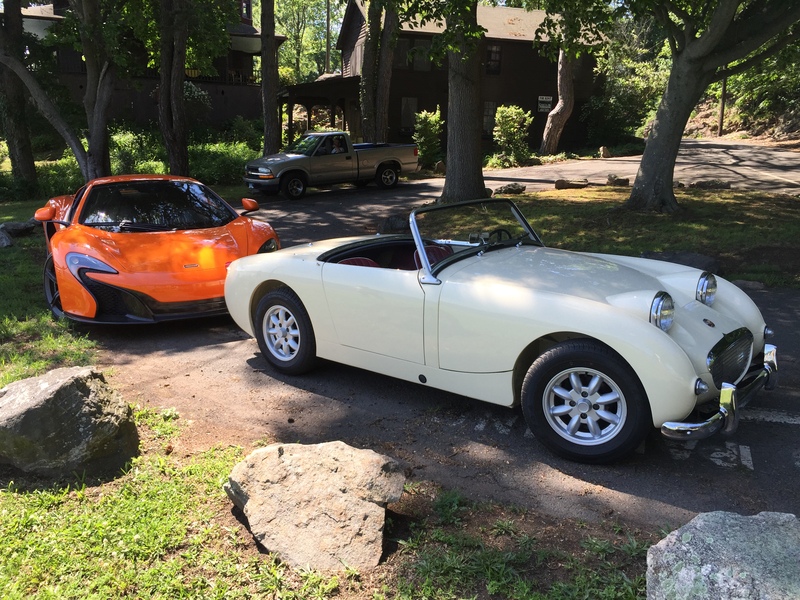 It was a great visit and we had a blast discussing flings we’ve had with cars. Click here to read his dispatch from our bastion of 1950s technology.